Yesterday was a good day. I got up super early so I could make the 1-ish hour drive out to the Copperhead Creek Shooting Club for the concealed handgun course that I signed up for. The course was good. There were only 3 of us in the class, so it was a very relaxed atmosphere. Plus, I know the instructor, so he picked on me to do a lot of the reading out loud of the material. Haha. I didn’t mind. At the end of the almost 5 hours of classroom, we took a 25 question test. I missed one…because I didn’t read the whole thing and selected only a partially correct answer…oops. Oh well, I still passed. Then we made the move to the tactical range for the live fire portion of the course. I scored 214 out of a possible 250. YAY! So, now all I have to do is scan all my paperwork (just in case it gets lost in transit, I have copies of everything) and then mail it off! And then, after a couple/few weeks, I’ll get my Texas CHL in the mail! In the meantime, I need to get a “pocket” holster for my duty weapon (it’s the only gun I currently own…I do plan to buy a smaller, second gun, but I’ve got to pay for my trip to Oregon and Las Vegas first) so I can carry my duty weapon in my purse once I’ve received my CHL. When I got home yesterday, I was exhausted. So I figured I’d set my alarm for a couple hours and take a nap and then go and do my 3 mile run on the treadmill and gym workout. My alarm went off a couple hours later and nope…still exhausted, so I set it for another hour later and went back to sleep. Woke up again and nope…still a no go. So I gave up on going to the gym because even if I went, it wouldn’t be a quality workout. Also, I don’t want what happened last year to happen again. I don’t want to feel like I HAVE to stick to a certain schedule. So, even though I made up a running schedule for the month of January, I don’t think I’m going to use it. I’m just going to run on the days I want to run during the week (at least 3) and I’ll run whatever miles I have time to run/whatever miles I feel like running that day. I want running to stay fun for me. I don’t want it to be a “have to” thing. I’m not anyone that’s trying to qualify for Boston. I’m not an elite. There’s no reason for me to hit a certain mileage. I mean, I *DO* need to make sure I’m ready for the half marathon I’m running next month and I *DO* want to run a full marathon later this year in Las Vegas, but I don’t want to make running something that I dread doing like what happened last year. So, that “bonus” run I got in Thursday morning turned out to be my 4th workout for the week…but also my final workout, since I didn’t workout last night. Weighed in this morning…good news! The scale is moving in the CORRECT direction: down. I weighed in 2 weeks ago at 185.2. Last week I did step on the scale and it said that I had gained just over a pound (if I remember correctly, I think it said 186.4). Today, it said 184.6. So, that’s a just over 2 lb loss from last week, however that 7 lbs lost goal I want to reach by my coworker’s retirement party at the end of the month? Yea, I’m measuring that from the weigh in I did 2 weeks ago, the 185.2. So, that would mean I need to get down to 178.2 or less by the 31st. I still have 6.4 lbs to go. I CAN DO THIS!!! I was itching to run this morning, so after I ate my breakfast and my coffee, I headed out for a 4 mile run. It was chilly, so I had to bundle up. 37° at 11am. Not much warmer when I actually headed out the door an hour later…just 4° “warmer.” And, actually, if it hadn’t been for the 20mph wind, it would have been alright. 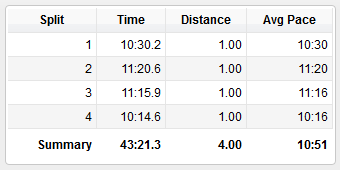 However, I was running INTO that wind for about 1.5 miles of my run, hence the 11:30 and the 11:15 second and third miles. But, it seems that mile 4 is “my mile.” This is the second 4 mile run I’ve done in the last week and both times I dropped my mile pace from 11+ min/mi down to 10 and some small change per mile. Guess I’m warmed up by the time I get to mile 4, hahaha! But yea, I was totally cruising for mile 4. I felt great! After my run and shower, I met up with Mark to help him set up his new blog!!! So excited!! He’ll make his first post tomorrow after the official weigh-in for the “Biggest Loser” competition his company is doing and he’s participating in. You can follow along with his progress as he melts away here. I’m hoping he’ll make daily posts, even if they’re just something short, to say how his eating went that day and to detail his workouts and to let everyone know how he’s feeling. Plus, he’ll be making weekly weigh-in updates on the left-hand side of his blog (just like I do). So, hop on over to his blog and follow him! And, please, comment on his posts and give him encouragement! After Mark and I parted ways, I had to go grocery shopping. I ended up going to THREE different stores to get everything I needed. Ugh. It’s all good though…I’ve got everything I need to last me through AT LEAST the first part of next week when I get paid again. I also bought nuts and dried fruit to make my own trail mix as the 6th week of the Shred Diet calls for homemade trail mix. YUM! I like the new look. I'm going to Archivers in Cedar Park in the morning with my mom. Hoping to leave my house by 9:30am. If you want to go let me know. Congrats with the CHL!!! !